Here is one of the eggs my mother and I colored for Easter. Red has become our tradition after she and my son celebrated the Resurrection in Greece, where the eggs are red instead of pastel, many years ago. Would you like to dye your eggs red next year? Here’s the dye we used, the best of several I’ve tried. Χριστός ἀνέστη! Christos Anesti! He is Risen! Find more Ruby Tuesday posts here. Next Post One book into the perfect movie…how about The Secret History? Gorgeous!My Ruby Tuesday is at Nostalgic Marveling blog, have a great week!! Those are so much brighter than my Grandma's eggs! I'm going to give her the recipe for that for next year. MMT sure did rant…too bad the comment had to be in view for everyone. As my quote says on my blog Trouble with Theocracy is that everyone wants to be Theo. But…in all respect to both views, I simply LOVE the red dye you used. It's wonderful!! !Here's my link: My Ruby Tuesday Do stop by if you get a chance. Red is probably my favorite color, so I think your egg is just gorgeous. Oh, my goodness! I'm SO glad MMT posted her response about rising and being raised. Here's the reason I'm glad, from my response to Arti in my current blog entry:Just this weekend a friend who still is recovering from a stroke told me about her experience of trying to read a price tag on a bottom shelf in a store. She lost her balance and ended up sitting on the floor, unable to get up. Had it not been for a teenager down the aisle, she might be there still.She says she’s always laughed at those “I’ve fallen and I can’t get up” commercials, being an independent sort and able to function without assistance. No more. She also mentioned that actually asking for help was the hardest part of the experience. Isn’t that always the case?And now you’ve given me something to ponder. Both the Apostles’ and Nicene Creeds proclaim that Jesus “rose from the dead”, with at least the implication that he did it under his own power. I seem to remember other texts being translated “was raised” – quite a different thing. I guess I’m going to have to put the issue on my to-do list!Ask and ye shall receive, we say – but we rarely get such a quick response! 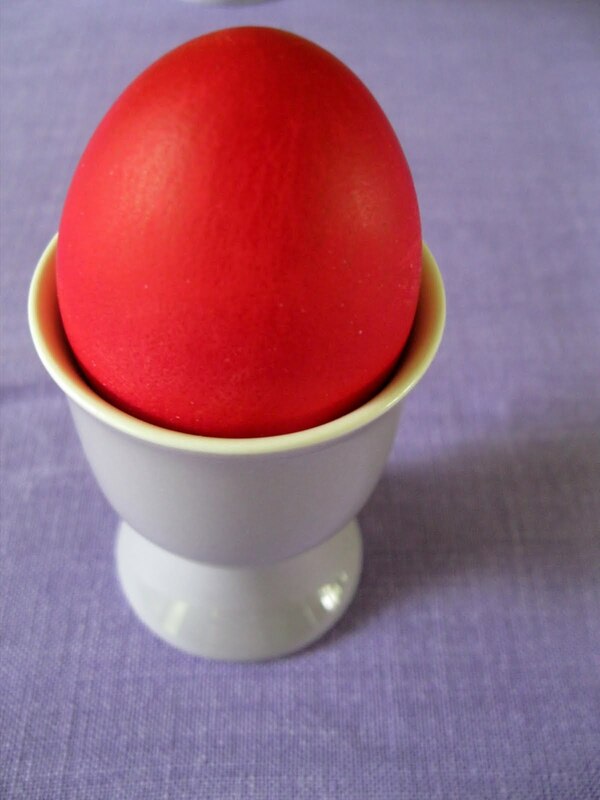 I just love this red egg. It is so rich and gorgeous. I may be tempted to dye my eggs red for Easter 2012–if not before. It's so… red! Great idea. Do you also to patterns? Shoreacres, it's interesting that you agree with Magical Mystical Teacher on his point. And while I agree with both of you that often one needs to be raised, and that not always of one's own power, I don't think that saying Christ is Risen negates that. I always think I'm saying, "Christ is risen because God raised Him. "But, I so respect your opinion, and Mark's. Alexandra, I used to make the absolutely beautiful Russian eggs with a stylus filled with hot wax and multi-colored dips. Then, you polish them until they positively gleam. I loved them, but they're quite time consuming to make. And, a bit tricky. I'll make them again some day, but this was not the year. Upon Linda's prompting, I must come here and plunge in… albeit a little late. But, please allow me to share my thoughts:In the sentence "He is risen", the word "risen" is used as an adjective, like 'He is tall'. It just depicts a state, the risen state, without indicating how He comes to that state. So the statement itself is not wrong.Now as to how He comes to that state, Bellezza I agree with your point in that He is risen because God the Father has raised Him from the dead. And, if we adopt the concept of the Trinity, then saying "He is raised" and "He rose" could then be interchangeable, isn't it? For If you want to distinguish the three distinct functions/characters of the Triune God, then you say God the Father raised the Son from the dead. But if you see the Triune God as one Unit, then it's fine to say "He rose", since Jesus is very much God Himself. The Bible uses both active and passive voices. While MMT has quoted verses that tells us " Jesus was raised", there are verses that use the active voice:Matt. 28:6 "He is not here; he has risen, just as he said…"Mark 16:9 "When Jesus rose early on the first day of the week, he appeared first to Mary Magdalene, …"I Thessalonians 4:14 "We believe that Jesus died and rose again …"Just my two cents. Arti! You wrote so very articulately what I was trying to express, that He is Risen does not negate He rose because of His Father's help. I agree with you completely, and I'm assuaged that I have not been "wrong" (scripturally) in saying He is Risen. Thank you for your beautifully written comment.